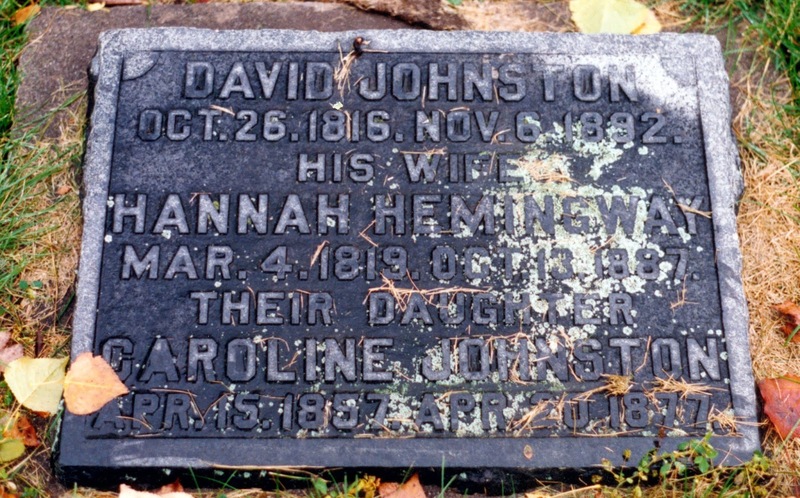 In my early years of researching my ancestors, my mother and I headed to Unionville, Ontario, (now part of the City of Markham) to see if we could locate where her great-grandparents were buried. We weren't successful in doing so. We asked a young lad working in a store, where was the cemetery for Unionville. He didn't know. Despite not locating the cemetery, we did have a very enjoyable visit to the community where they had lived. Later, at a meeting of the Bruce-Grey Branch of the Ontario Genealogical Society, we were asked at the beginning of the meeting to share what we were working on, in our family research. I mentioned my visit to Unionville to find the burial location of David Johnston and his wife Hannah Hemingway. I was in luck that day that there was a person at the meeting from that area who spoke to me after the meeting. She took my address and wrote down their names. I didn't think anything more about it, but one day an envelope arrived with this photo of the marker. They are buried in Hagerman East Cemetery, Markham, Ontario. We were able to go on another trip to visit this cemetery.